New ILO Member Serving Sudbury Coming Soon! Most Canadians would not be surprised to learn that motor vehicle collisions are the most common cause of serious injuries and fatalities resulting from an accident. Of these, rear-ending another vehicle that has slowed or stopped is one of the most common types of collisions. When one vehicle rear-ends another (i.e. hits another vehicle from behind), the risk of fatality is less than with head-on collisions or rollovers; however, many victims of rear-ending experience serious injuries that result in pain and physical disability for the rest of their lives. With respect to whom is at fault in car accidents, ‘rear-ending’ is atypical because police and the courts lay the fault in these collisions 100% on the driver of the vehicle that rear-ended the other. This is true in all but the most unusual of situations; for example, if the car in front suddenly had a significant mechanical failure like a blown tire, the fault in a subsequent rear-ending may not entirely rest on the car behind. On August 9th, 2015, an accident occurred on Highway 69 south of Sudbury, when a northbound Jeep rear-ended an SUV that was turning left into the French River Trading Post parking lot. The SUV was pushed into oncoming traffic and hit a pickup truck travelling southbound. Two of the pickup occupants suffered serious injuries, one of whom was trapped inside before being extracted and airlifted to a Sudbury hospital. The other vehicle drivers were treated for minor injuries at the scene of the accident. OPP charged the Jeep driver who was responsible for the ‘rear-ending’ with Careless Driving. In Ontario, police often lay Careless Driving charges in rear-ending situations, even when there are no serious injuries to vehicle occupants. Careless Driving is a serious offence that typically results in doubling of a driver’s insurance rates as well as 6 demerit points on your driver’s licence. Citing Beaumont v. Ruddy, 1932, in the recent trial of Rahimi et al. v Hatami et al., 2015, the judge asserted that negligence in a rear end collision has remained the same in Canada for almost a Century; the general rule is that when one car hits another from behind, the fault is in the driver of the rear car, who must satisfy the Court that his/her negligence did not cause the accident. Essentially, the burden of proof to disprove negligence is on the driver in the rear. In the case of Rahimi et al. v Hatami et al, the defendant and plaintiff were friends and driving to the movies in separate cars, when Ms. Rahimi’s vehicle decelerated in response to an amber traffic light at an upcoming intersection. Mr. Hatami was allegedly following closer than he normally would because he was unfamiliar with the directions to the theatre and did not want to lose sight of the car in front. Ms. Rahimi’s car was rear-ended by Mr. Hatami, who alleged that Ms. Rahimi decelerated abruptly even though she knew he was directly behind her. However, Mr. Hatami’s claims of an abrupt stop were not collaborated by the passengers in Ms. Rahimi’s vehicle. Even if it were true that Ms. Rahimi stopped abruptly well before the intersection, the court ruled that the driver who is following, in this case Mr. Hatami, must nevertheless always leave sufficient room to safely stop given the speed and driving conditions. Even in the case of unexpected circumstances, such as when a deer or moose runs across the Highway, a not uncommon event in the Sudbury area, drivers following behind another vehicle are expected to leave enough distance to react safely. Drivers are also expected to know the limitations of their vehicle, such as braking ability; a vehicle that is not mechanically capable of stopping in time is not a satisfactory excuse for rear-ending in Ontario. Whiplash is an injury that frequently occurs with a rear-end collision. It results from the abrupt stopping motion causing the accident victim’s body to be pushed forward while their head remains in a fixed position. This whip-like motion can cause a myriad of neck injuries, termed ‘whiplash’. Contrary to what is normally thought, whiplash occurs more often when a vehicle is travelling at lower speeds. Common symptoms of whiplash include: pain in the shoulders, arms and neck; headaches, dizziness and blurred vision; difficulty concentrating; sleep difficulties and fatigue; and decreased mobility and range of motion. Rear-end accidents can result in severe back pain and neck pain, that may have a long-term impact on a victim’s life. Whiplash and other symptoms resulting from such collisions may take some time to manifest; consequently, accident victims should immediately seek medical attention so that undiagnosed injuries do not worsen over time. In some cases, rear-ending results in very severe injuries such as brain injury, spinal injuries, loss of limbs, and even death. Victims of rear-end collisions who have sustained serious or permanent injuries are owed compensation for what was lost due to the accident. Compensation may be sought for pain and suffering, medical costs, family member expenses, and other damages resulting from their injuries. 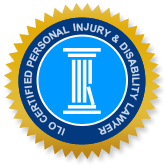 Accident victims who are unable to work over the short or long-term, or can work only in a diminished capacity, need to be compensated for lost income as well. If you were seriously injured in a rear-ending caused by another driver, you have an excellent chance of being compensated for your injuries with the aid of a skilled personal injury attorney. The driver responsible for rear-ending another vehicle is almost always found negligent in these cases. The Sudbury Injury Lawyers of Ontario (ILO) are attorneys with vast experience and expertise in seeking damages for accidents resulting from rear-ending and other careless driving actions. Most often, we can obtain a favourable settlement for you without going to trial; however, we are prepared to fight this case for you in court in order to get you the damages you deserve. Call us today for a free consultation and candid advice about what you can expect during the claims settlement process.